The social networking wars are pretty intense these days. Bebo, the global social site popular in the U.K. and Ireland, is differentiating itself from MySpace, Facebook, and the Google Open Social effort by aligning with TV, film, and music companies. At the same time, Bebo is allowing its diverse content partners like the BBC, CBS, Channel 4, ESPN, Ministry of Sound, MTV Networks, Turner, Ustream, and Yahoo! to use their video players to distribute their content and retain all of the advertising-related revenue. Bebo claims 40 million people worldwide are a part of its community, with the bulk made up of people 13 to 24 years old — and those who consume and share all sorts of video and music content. Bebo already produces original content with “LonelyGirl 15” spin-off “Kate Modern”, “Sofia’s Diary”, and “The Gap Year”. 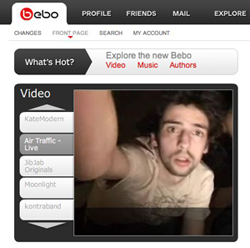 Now Bebo wants to aggregate TV shows to improve the site’s “stickiness” and increase the value of its own advertising. Is the Internet the fifth major TV network? 7digital, music downloads done right?